Went to watch Hors de Prix or Priceless as it is called in English last Tuesday. Had a free ticket which can be used for 2 people. I didn't feel like asking anyone. Been feeling quite anti social for some time now. Perhaps it could also be because lately somehow when I asked people, I was rejected! As a matter of fact, I did ask someone to watch this with me, but I was rejected vilely, with excuses like "I have to check my schedule", "I might be busy", "Why don't you ask someone who will be more interested?" Shouldn't one just be honored that one is asked and kindly oblige this person who perhaps has other people to ask and yet choose you? Wow, apparently I can still feel pretty upset about it even after quite some time. Anywho, so I didn't want to ask anyone, so I told Yeni that she could use my plus one for her friends. I thought she would be bringing some people but apparently her people bailed out on her. So it was just me and her and Maureen and her friend. Even the people who initiated this didn't seem to come, silly people! In the topic of being alone. Was around in the Merlion Park area last Friday. Alone! What can you do about it right? Took some pictures there, which you can see here. There were the proper ones like this typical postcard picture of Singapore. 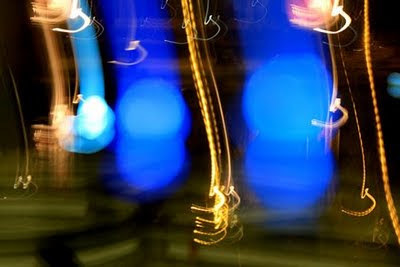 But my favorite one is this one from the lighted balls in front of Esplanade. Yes, it is not a "correct" picture but I just love how it turned out. 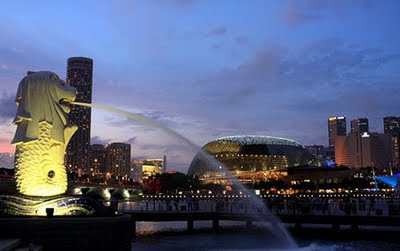 Merlion Park does look nice at night with the lights and all. I wondered if some of the tourists standing there felt what I felt when I saw the blue water in Cinque Terre. To describe how I felt, I can only use words such as these, the water is so blue, thank you God, I am here, my God I am here. So about the movie. I actually like it very much. I have to say that I didn't re-read the book again before going to the movie and so I think I forget many details and as such perhaps this is the reason why I wasn't so critical. I think it followed some of the things in the book nicely. I thought all the actors were great. Normally I would say I love Ron Weasley the most but this time around I love Tom Felton's Draco Malfoy. His character is actually one the characters that I quite sympathize in the book. I thought he did really well. I thought Daniel Radcliffe's acting as Harry Potter is better. I quite like him here. I think he's lucky to have the Felix Felicis' scene because with it, we could see a different side of him, a more relaxed one. I was kinda happy too to see Hermione's scene in which it showed her having bushy hair after failing to beat Harry in potion, kinda love to see that side of Hermione. I also related to her a lot when she was so sad when she saw Ron snogging with Lavender. Even though I know it's written in the story, I was still kinda in disbelief that Ron did that, I guess guys can just snog any girl :( Then I thought Dumbledore's fight scene against the inferi was very cool, fitting for the great wizard Dumbledore. His dead scene, though not all the same as the book, was quite touching that I had a bit of tear even though I didn't cry when I read it in the book. Okay, lighter note. On today's poems reading there were a lot of sky, moon, sun, and rainbow that I found my poem to be quite ordinary :( It was really difficult to make this poem. I guess it's because my knowledge is so limited and (I really cannot deny this) I do kinda take things seriously, so it was really hard to put my poem into its final version because it is not what I feel. In fact I had tried to change the last line but after reading them to Chloe and Maxime, they said I have to stick to the more romantic one. Maxime seemed to have strong opinion on how the last line should better be :P Chloe on the other hand found the whole poem to be strange. Kids, I say :P Then Mademoiselle Margie helped me choose better words and I do have to say that the final version as cheesy as it is (it is really cheesy!!! ), it is kinda very very sweet. Iirggh, saccharine sweet is really not what I am feeling right now so I am really really deeply struggling with it. Here you go though. Compare this with the italian poem that I wrote in my last Italian class. You see that one had a skill of almost 3 years and the feeling involved in writing that flowed more easily and willingly. Anyways, I was thinking that the french poem above will still rhyme in Italian, così eccola. Anyway, the movie was okay I suppose. I kinda didn't like the ending so for me it kinda spoiled the whole thing. I do love Clive Owen a lot :P I wonder if I saw him in real life, as a normal guy, would I be attracted to him? Hmmm. Julia Roberts was pretty, it's been awhile since I last saw her on the screen. She looks not so skinny, normal human shape actually. It does bother me to notice and feel that she's not skinny. She's normal and normal is okay. I have to say that Paul Giamatti was very entertaining :D He's funny! I can't really say I like the movie very very much. It wasn't bad, that's all I can say. Gonna go to Pulau Ubin this Friday with the team. I am so excited about it!!! This is my first time going there and I am happy that I finally get to cross this from my Singapore list. Need to pray for good weather though. I really hope it's not gonna rain because that would be a huge disappointment for me. We're gonna see the Da Vinci exhibition instead if it rains :( I am so looking forward to cycle again. The last time I rode a bicycle is I think when I was in my 1st year in NUS, when we did night cycling. Hmmm ... suddenly, I got reminded of this senior that my ex-roommate, Stella, had a crush on. He fell and that was funny! I still have a smile in me now remembering that :P Oh yeah, talking about Singapore list. I didn't get NDP tickets, aarrrgghh ... so this is something that I cannot cross. I have to stay at least another year? That is so not cool! Enough about that. Today is Indonesia Presidential Election day. Voted and mailed my vote yesterday. Apparently in Jakarta (at least), if you showed your inked finger (you need to put one of your finger in ink after voting) in Starbucks, you can get free drink. I love that it's like that in Indonesia. I also like and envious with the fact that it's public holiday there *sigh* Anywho, quick count results show that it's as the polls have been showing all along. I hope that's how the final and official result goes and no funny business going on. Considering so many things that have been happening in South East Asia for the last year or so, Indonesia is actually looking not so bad right now. I still think it will take a long time for Indonesia to progress and improve tremendously, but I guess because it's Indonesia after all. We are laid back and you know at a certain point, I guess you have to be like that. You gotta relax and calm down a bit, a trait which I don't really have right now. Yes, I am high-strung, and yes perhaps all the time *sigh* Okay, enough for now. Take care peeps! Olla guys. Went to watch Transformers: Revenge of the Fallen with la Gioia yesterday. All the reviews said that this movie is bad but I actually was well entertained by it. Can I just say that I love Shia LaBeouf? :P Yeah, I like this type of guys. Anyways back to the movie, yes, there were some lame stuff but it wasn't all that bad. They were bearable. Yeah, the humans didn't really have much role except for the running around and freaking out but I had such a good laugh with them, especially the new character, Leo. It's good that I can laugh out loud :D The whole effects were really cool, I have to say. All the explosion and stuffs were kinda colossal. I hope they had much fun doing it, because it looked so cool and it seemed like lotsa fun to do all the explosion. Did some reading on the movie and found out that they could take days just to render 1 frame with the transformers in it. It's kinda crazy and also shows how much hardwork and patience are needed to make this movie. Amazingly cool. I felt that I actually had a better experience on this second movie that the first one. On other news, well there's nothing interesting to say actually. Finished my last Friday session last week and so no more long Fridays from now on, instead I have early morning Saturday routine. It's gonna be tougher compared to when I had my Italian classes but I am committed :P I really need to work harder though. It feels like I haven't been making any effort at all actually. Been talking to people or perhaps been listening to people. Well as I said before, on some people I don't mind hearing them, on others I do wish they would stop focusing on themselves. Today, I unexpectedly had quite a long msn talk with Ms. Sab. We don't really talk much actually except for the normal salutation here and there. It's kinda interesting to know that we can actually have an interesting conversation / bitching session :P I guess it happens, doesn't it? You see a person and you have a feeling that there's nothing in common with you guys, but maybe if you start talking, you'll find that strangely you can be good friends. This kinda things do happen to me. So anyway, as I said I have been listening to people. I guess on some people, I know they really need the reassurance because they are in difficult situation so as much as I can I do try to hear them out and tell them things will work out. I don't know if I am doing the right thing though because I believe that God may not be there for you on your bad decision, however I like to think that no matter what, after we learn our lesson, God is there. On the other side, I feel like I actually have so many things that I want to say, that I want to let off my chest and head. However, somehow when people asked me how I am, it's like they just do it for the sake of asking and don't actually have the time to stick around to hear me out *sigh* and I also don't know, it just feels that there's noone that I can feel comfortable with telling how I feel. I think again it's because perhaps they're uninterested and also perhaps they will then start advising me and those things kinda make me feel worse. I wonder how I am like when I listen to all these people that they actually come back and tell me their issues.